Say Goodbye To Your Turkey Neck This Holiday Season! I Love My Turkey Neck (Said No One Ever)! As Thanksgiving quickly approaches, we decided to dedicate an article to the permanent solution to fat underneath the chin - say goodbye to your turkey neck! The turkey neck or double chin (medically referred to as “submental fullness” or “submental fat”) is an equal opportunity. It presents in men, women, thin people, and heavier individuals alike. Thankfully, the FDA approved Kybella is a permanent solution for the turkey neck. Deoxycholic acid is naturally produced by our bodies and helps to absorb fats. Kybella is identical to this naturally occurring acid. When injected into our “submental fat”, Kybella physically destroys and permanently dissolves the fat cells which create the double chin. 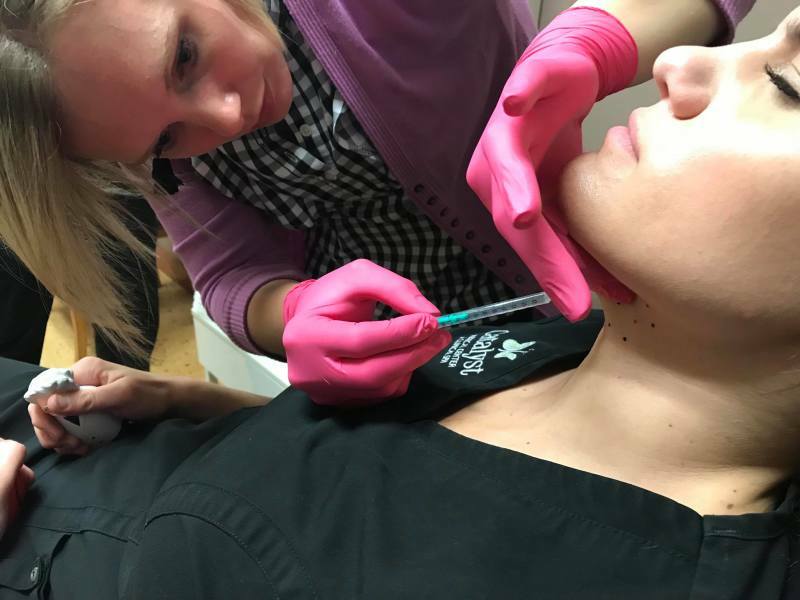 The Kybella treatment is super quick! You will be in and out of Catalyst within 45 minutes - sometimes even less. Before we begin the Kybella injection treatment, we ice the area underneath your chin. Next, we apply a treatment “grid”, which is like a temporary tattoo, to act as an injection guide. We inject Kybella next to each “dot” on the grid. You will feel a slight prick and a burning sensation as the medication is melting the fat away. Post-treatment, you're welcome to relax in our spa lounge and ice the area for as long as you would like. The most significant side effect of this procedure is the substantial swelling which occurs afterward and can last up to two weeks. However, even with this side effect, our Kybella patients all agree that the procedure was well worth it and they would do it again without hesitation. Fall/winter is the PERFECT time to get Kybella because you can camouflage the swelling by wearing turtlenecks or scarves! No one will even know! Typically, to achieve our patients’ desired results, we need 2 to 4 treatments approximately 6 to 8 weeks apart. This aspect of the procedure is customized patient by patient - some patients just need one treatment! And finally, the result is PERMANENT!! Your turkey neck is gone forever and we promise you won’t miss it! See how Kybella can help you achieve the sculpted look you've always desired! Our experienced providers will assess the area, answer all of your questions, and give you your treatment plan!